Race Review: Energizer Night Race 2015 [12km] (by 'SinaiStrider') | JustRunLah! My first night trail. I’ve been looking forward to this one for a while, firstly I am a lot more comfortable on the trail than I have been before, so I’m always keen to get out into the jungle, secondly, it’s 12k which is a good distance for me and thirdly, I reckon I have an outside chance of a decent placing (shhhhh, dont jinx it). My buddies Rob and Pete are also doing the 12k, and a whole bunch of mates and running acquaintances are doing the 18k, so it will be another very social evening. I’ve gone with the Inov8 Roclite 243 tonight over the Salomon X Scream 3D. 2) the XScreams are about 80g heavier than the invo8’s, so I’ll pick the lighter shoe for racing. A new Compressport headband to make the headtorch a little more comfortable on my head and I’m all set. Running buddies and ex NS men talk a lot about ‘hill 265’ on this course, and I’m eager to give it a rip. As we arrive the 18k is flagging off. they have 30 mins head start on us, so I reckon that means only a few will complete the first 6km loop before we go, This is great, and means I’ll have a pretty clear run. We head to the start line and I meet Kjetl, a strava buddy that I have never met ‘in the flesh’ before. we have a quick chat, I see a few other folks I know and then we’re off. I know that pacing is key for a race like this, too quick to start or uphill and you’ll blow up, but it’s also important to get a strong start so you aren’t chasing the game. I head off in the first group with Mike Nolan from F1 who leads us out. Round the first corner and Ben and Dom (two other running buddies) turn the corner after their 6km loop. I run with them briefly, then Dom drops off with a slight injury recurrence. Ben and I run together for another few km’s, but there’s not much chatting as we’re both working quite hard. At this point I think I am in 3rd or 4th place, so my plan is to hold placing, whatever pace that requires and see what I have left after 9km. It’s not long before we start to climb, first a fairly gently ascent on a fire road, then turning a corner, I hit hill 265. It’s very steep and has sections carved out in the mud. It’s not really runable, so I sort of climb, walk, shuffle up to the top with another 18km runner. It’s not too taxing and I’m at the top before I realise it. Then there’s a seriously steep downhill section, I’m not ready to fly down just yet, in case my quads take a pounding and it impacts my position, so I go down quickly, but not stupid quick (save that for later). I’m feeling good, well clear of the nearest rivals. I also can’t really see the torches ahead of me, so there’s not much point now in racing too hard and risking messing things up, so I maintain a decent, but not super fast pace, to consolidate my spot in the race. 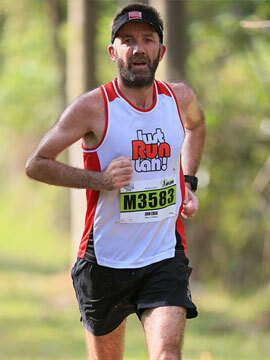 Run continues like this, tough ascent, fast descent until 8kms. Then what seems to be the longest hill appears. In the past I might have struggled mentally, allowing myself to feel that the hill was too big, too long etc… but since doing Lantau, I know this hill is really very small. So I just knuckle down, focus on my breathing and chug up until I get to the top, no drama, no racing, just steady controlled pace. This works a treat and I’m on the descent before I have time to think. It’s 9km now, so I know I’m nearing the finish. This time I properly let rip down the hill, some serious Michael Jordan air time between steps. This seems to go on for a while. it’s a lovely run in and I can hear the MC’s voice, so I know we’re close. I turn the corner and I can see the finish line about 400m ahead. I pick up the pace for a final charge and run through the tape (love doing that) in 55 mins. Lexus Tan from F1 is at the finish, he rushes up to me to tell me I am 3rd and therefore in the prizes! Wow. I’m buzzing now, delighted. I ran a good race, got my tactics right, I’m tired, but not exhausted and I’ve placed in an open category event. Waiting at the finish area I catch up with Ben who has had a stormer as well and finished 7th in the 18k (1:20). Rob comes in around the hour mark with an enormous grin on his face, then pete shortly after, also loving it. We head into the race village for some much needed refreshment. They have quite a selection, fruit, drinks, and ICE LOLLIES. OMFG if you have never had an ice lolly after a hot race, you dont know what you are missing. Honestly, the most amazing post race thing ever. 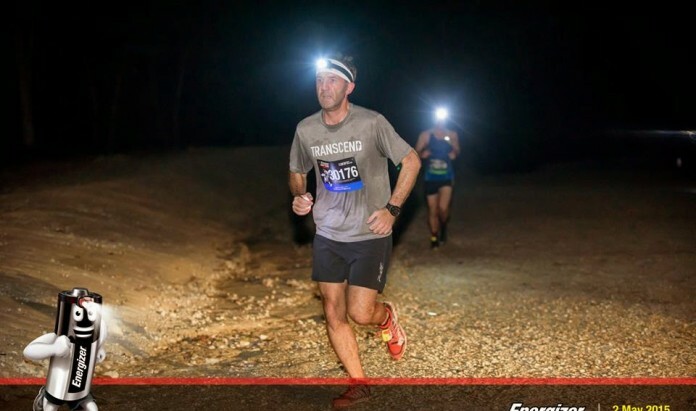 somehow the atmosphere after a trail race is always so much more relaxed and fun than after a road race, I’m not sure why really, since mostly in Singapore the same people do both types, but I definitely notice it and tonight is no exception. Finally it’s prize ceremony time, I wait side stage with Stu (3rd in the 18k), Jenny, Vanja and Anna (3/2/1 womens 18k) and the other winners. Eventually, the MC calls me up. I practically leap onto the stage I’m so happy, quick handshake and a few pics and it’s all over. Pete’s moaning that he’s missed the Liverpool match, but I know he’s well chuffed for me and we have a laugh as we wander back to the shuttle bus. Eventually get home around 1130 for a glass of wine after a very long, but successful evening. A great evening, even if I hadn’t placed I would have this race on my all time favorite Singapore races list! Loved every minute. yeah a colleague of mine at work today was telling me it used to be much longer as well. definitely wasn’t the toughest of the three big climbs on saturday night. cool event though! thanks – yeah, great race. Really well organised.